If you use PowerPoint or any other Microsoft Office program on Windows, then here’s a quick question for you. Do you know which version you are using? And if the version question seemed easy, do you know what sort of license you have for Microsoft Office? If you know the answers to both these questions, or even if you don’t, this post is for you. Let us explore easy ways to identify version and license details for Microsoft Office on your Windows system. Broadly speaking, new versions come with new features. 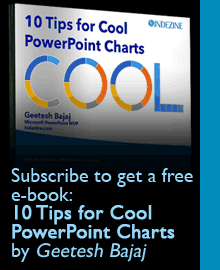 For example, PowerPoint 2013 for Windows introduced the Eyedropper tool, Enhanced Presenter View, and other niceties. However, the introduction of new features is no longer dependent upon the release of a new version—your license type may provide you with new features even a new version is not released yet! Yes, we are talking about Office 365 Subscription licenses that bring you new features every few months. That’s the reason why it is important to find out whether you have a Subscription (Office 365) or a Perpetual (Retail) product license installed! Run PowerPoint. If you see the Presentation Gallery, opt to create a new presentation, or alternatively open any existing presentation. Yes, you do not want to create or edit presentations now—but PowerPoint will not let you identify it under the hood unless you open a presentation first! We just created a new presentation, as shown in Figure 1 below. Next choose the File | Account menu option, as shown in Figure 2 below. You will see an updated screen, as shown in Figure 3, below. Do notice that you can see that no information about any subscription is shown. 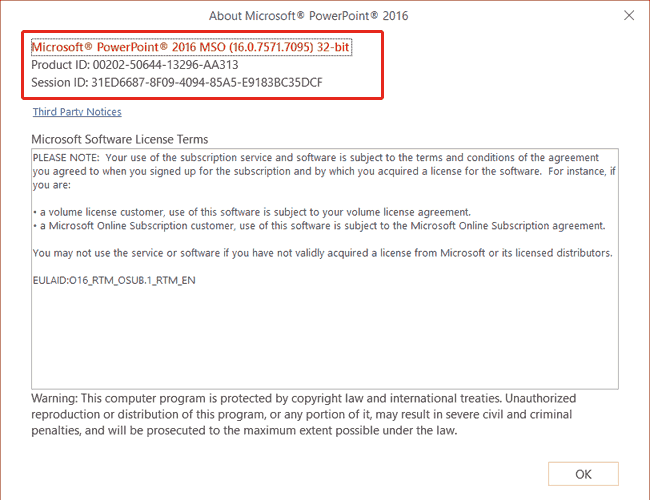 Note that you can read the Product Activated and Microsoft Office Professional Plus 2016 indications, as highlighted in red. The same dialog from a subscribed version will show a different license type: Subscription Product and Microsoft Office 365 ProPlus, as you can see highlighted in red within Figure 4 below (compare with Figure 3). Do you want to see the actual version number of the product? To do so, click the About PowerPoint button, highlighted in blue in both Figures 3 and 4. This will load up the dialog boxes shown in Figures 5 and 6 below. Although Microsoft names their releases with nomenclature such as Office 2016, Office 2013, etc., they follow a different nomenclature internally. Any version number that begins with “16” in the About dialog box indicates that you are running Microsoft Office 2016 for Windows. Similarly, any version number that begins with “15” indicates that you are running Microsoft Office 2013 for Windows, as shown highlighted in red within Figure 7, below. Additionally, there may be other numbers after the 16, 15, or 14. Those other numbers indicate updates released after the initial first release. Thank you so much, Anneliese Wirth, at Microsoft who helped me create this post.